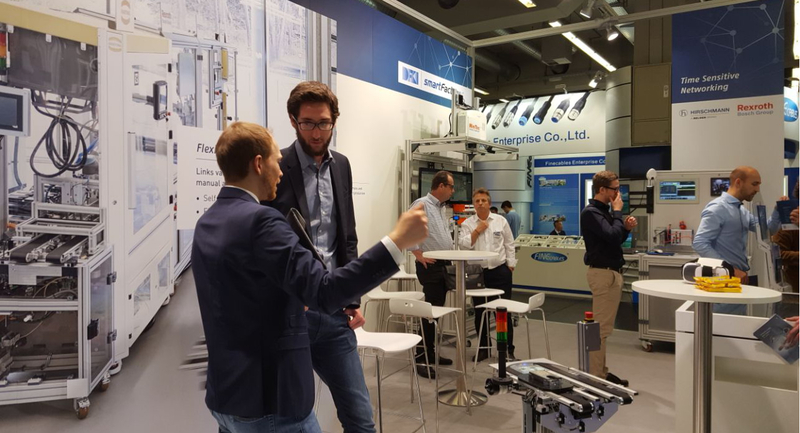 SmartFactoryKL and the Research Department Innovative Factory Systems of DFKI (German Research Center for Artificial Intelligence) presented the latest developments in Industrie 4.0 at the SPS IPC Drives Exhibition (28.-30.11.2017) in Nuremberg last week. These were, amongst others, modular assembly, innovative assistance systems, and real time communication (time sensitive networking, TSN). The exhibited technologies attracted many visitors. Especially the objective as a manufacturer-independent demonstration and research platform aroused interest amongst new visitors. The guests were able to virtually discover the Industrie 4.0 production plant with the help of virtual reality glasses and a touch table. Visitors interested in the digitalization in SMEs were also keen on getting to know the Mittelstand 4.0-Kompetenzzentrum Kaiserslautern. Many good discussions with SmartFactoryKL partners also took place. SPS IPC Drives is Europe’s leading exhibition for electric automation technology and takes places in Nuremberg, Germany. The 2017 exhibition saw a new record with 1,675 exhibitors and more than 70,000 visitors.